In my most personal novel to date, based loosely on personal childhood experiences, I explore what it's like to emerge from childhood into adolescence and discover that fun brother you've always had a blast playing with actually has developmental disabilities. It's a story about bullying, tolerance, and learning to rise above to be an advocate for doing what's right. ​You can order a signed copy from Parnassus Books in Nashville. If you write in the order notes that you'd like it personalized, they will call me to come in and sign it to you. Now available as an ebook for only $2.99! Also available through Ingram for booksellers and librarians. 2017 Children's Literary Classics Seal of Approval! "This is the best story about dealing with bullies and with a child with Autism I have ever read. I found myself crying from the sheer heartwarming moments in this story about a sister who looked out for her older brother. He was challenged in his life of sixteen years with so many things. Yet, he remained happy and virtually unaffected by all the nonsense from mean children in his neighborhood. He could give a lesson of humanity to many about how to bounce back from negativity. His sister tried so hard to help him but also had to deal with kids that were terribly mean to her as well. The lesson she taught them with the help of some teachers was priceless and defined the true friends from the fake ones. This was a wonderful story and I recommend everyone read it. One should never be ashamed of themselves or others for a disability or anything else. It is who we are inside and the spirit we hold that dictates how we tackle friendships all our lives. We can also change with understanding through life lessons. This book was a truly beautiful reading experience. Bravo! FIVE BIG STARS!" "Beautifully tells a story about how one girl learns to balance a complex situation at home with a complex situation at school... Adults who remember reading books by Katherine Patterson and Paula Danziger will recognize the honesty with which it is written." ​​"This is definitely a book that I recommend for kids with a sibling on the Autism Spectrum, or with any other disability, or who just want to broaden their horizons and learn a bit more about some of the many diverse personalities out there that make up our kaleidoscope world. A great read especially in April for Autism Awareness Month!" "This middle grade novel tells the story of a brother and sister relationship; it’s quirky, loving, there is tension, and it’s complicated too... This book is heart-wrenching. D.G. Driver pulls you in immediately. You see Heidi try to process what is happening. We use the complication of protecting her brother. She works hard not to embarrass him. Heidi loses friends because they misjudge Donald. I admired how much Heidi sees the loss she is experiencing, she sees the unnecessary bullying she is enduring, but she does not back down from defending her brother. I love a strong sibling relationship and No One Needed To Know has done such a good job. The story takes a turn I didn’t see (I hate spoilers, so I won’t share), but I will say: I cried. As soon as the book ended, I immediately wrote D.G. Driver and thanked her for her book. It’s beautifully done. While this is a middle grade book, I think parents should read this book. It’s a great way to discuss being kind to friends and their family members. Autism, as well as other special needs should not be seen as “problems” (a teacher in No One Needs To Know addresses this), but as people who can grow our hearts with compassion, empathy and FRIENDSHIP." "I am a sucker for a strong female character, especially in middle grade and young adult novels, and Heidi is one of the more convincing 11 year old characters that I have read in recent times. She is smart, passionate, caring, athletic, and yet still has the flaws that make her a convincing, well-rounded character. Throughout the story, Heidi has many struggles that readers can relate to as she is grappling to understand life, especially her brother, who isn’t quite like every other 16 year old... Consequently, as you read through the scenes of this book, you can feel the love, confusion, and cringe-worthy moments that come along with self- discovery and a preteen’s introduction to the encroaching awareness of other’s opinions. "This book also has a graceful way of introducing readers to the variety of developmental delays or disabilities that someone may see when interacting with a population of people with special needs. It is informative as well as entertaining, and could serve as a way to open up conversation about a potentially tough topic. I also appreciate that D.G. Driver also goes a step further to including links to resources that are useful in learning more about Autism in the back of the book. All in all, an enjoyable and authentic read that entertains and informs all in one." "All children need to read this book to learn about situations children in families with disabled children face each and every day. They also need to learn how to relate to these challenged individuals as feeling persons, not to pity them, but to understand, so they are not afraid. The situations in the book are realistic, the feelings genuine, and the outcome extremely reasonable. It is a short book and would make a great classroom project. I highly recommend it." I would definitely recommend this book to teachers and students alike (as well as literally everyone else on the face of this planet), since it promotes activism and empathy, two characteristics that Heidi strongly displays in this book. The great thing, though, is that Heidi isn't necessarily this way right from the start - as a reader, I loved seeing her evolve from a rather insecure girl who can't really stick up for herself or her autistic brother, to a strong-willed, caring girl who makes for a perfect role model. And although this story was short, Driver got her point across easily with great writing that made the story flow nicely from start to finish. There was never a dull moment, which I loved. ​All in all, a fantastic book that I highly recommend to literally everyone, no matter who you are! In this very sensitive novel about autism awareness and bullying, Driver develops characters that are realistic and evoke sympathy. In keeping with the theme that people are afraid of that which they do not understand, once word gets out that Heidi's brother is developmentally disabled, a secret Heidi kept to herself for years, she becomes ostracized from her friends. Now, not only is her brother the victim of bullies, she too is being ridiculed and tormented by classmates who do not understand Donald or his condition. I listened to the audiobook which I received free at my request and offer this honest review. Allie James authentically voices these characters and presents the appropriate angst for the young hero, her friends (and enemies) and her brother. D.G. 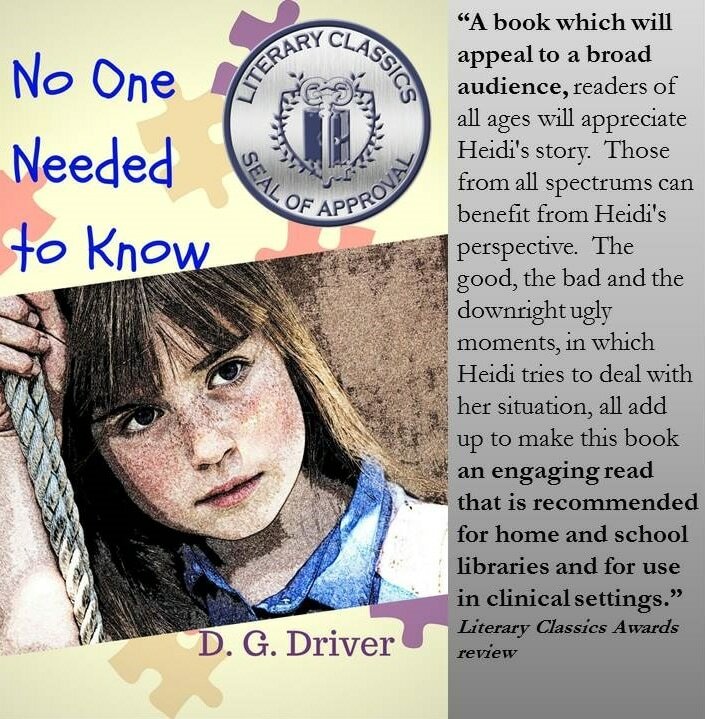 Driver presents a powerful message of discovery, Heidi's discovery that impacts her whole circle of friends. Transformation ensues. Amazing that it's couched in this 2hr 40min tale. I do school presentations about bullying and special needs awareness for upper elementary and middle schools. ​Learn more at www.dgdriver.com/about-me.html or email me. This is from a scene about half-way through the book. Heidi has been skipping school because the kids there have been bullying her about her brother. She hasn't told anyone about it, hoping it will all blow over. Donald was walking his bike down the street toward the house. He wasn’t making any loud noises. What was up? I got out of bed and threw on some sweatpants to go with the sweatshirt I’d been wearing in bed. By the time I was dressed, Donald had come in the garage door. “Oh, my . . . Donald! What happened?” I heard my mom cry in alarm. “I think I rode my bike in front of someone’s car,” he stammered. By this time I’d run down the stairs to see for myself. Donald was bruised up, with cuts all over his arms. His khaki slacks and cotton shirt had grease stains and large rips. I gasped at the sight. “It was Matt and Daryl, huh Donald?” I clarified. “Heidi,” my mom warned, knowing I was pushing him too hard. “I . . . I . . .” Donald began to break down. Forehead creased, strained smile. I knew the expression well. I stormed back upstairs and slammed the door. My mom hollered after me. “Heidi, get back here!” I didn’t respond. I didn’t care what my mom thought of me right then. If Donald was going to let bullies beat him to death, let him. I wasn’t going to protect him anymore since no one bothered to protect me. Fifteen minutes later (I guess it took that long because my mom had to help Donald clean up all his scratches), my mom walked into my room and closed the door behind her. I turned over and buried my face in my pillow. “Nothing,” I said, but it was muffled by the cotton fluff. “You think it would be better if Donald fought those boys?” Mom asked. No One Needed to Know is fiction, but it is loosely based on my experiences growing up with an older brother with Learning Disabilities. In real life, I did suffer from bullying in elementary school, however most of it was not about my brother. I did watch him get picked on and made fun of a lot. My mother taught in PreSchool Special Education when I was growing up, and one of my earliest jobs post college was substituting in the classrooms at her school. I eventually made a career out of teaching in various schools for special needs. I currently work as the lead teacher in an infant classroom at a child development center with the mission of teaching special needs students alongside their typically developing peers.